You can switch the driver assist systems listed in the Assistant menu on and off with the button on the turn signal and main beam lever . Press the button in the direction of the arrow to open the Assist systems menu. Select the driver assist system and switch it on or off . 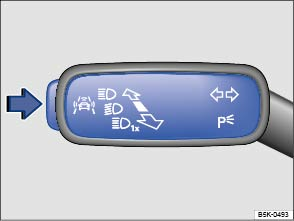 A tick indicates that a driver assist system is switched on. Mark and confirm your selection by pressing the button on the windscreen wiper lever, or by pressing the button on the multifunction steering wheel . Driver assist systems can also be switched on and off in the infotainment system by pressing the button and the and Driver Assist function buttons . Perform battery test with battery tester with printer -VAS 6161-.